Life isn't so easy for eleven-year old Kat Greene. Her mother is always cleaning, to the point where Kat is beginning to get frustrated and worried. Her mother's habits, such as her obsessive hand washing and the need to wipe down canned goods at the grocery story, do not seem normal to Kat. On top of this, Kat has been assigned a less than desirable role in the school play and her best friend's obsession with a crush threatens their friendship. Kat is not always sure how to navigate these challenges in her life, but she works through them the best she can, always keeping the feelings of others in mind. Kat has many traits to love. She is sweet, humorous, and a good friend. Her character is true-to-life, making her the story a believable one. 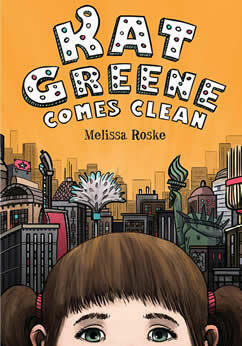 I think middle grade readers will relate to her and see themselves in many of the moments that Kat experiences. This is an engaging and readable book. I wanted to keep reading to make sure everything would work out for Kat. There were also parts that made me chuckle. I think young readers will be interested in reading about Kat and how she copes with the challenges of her life. She can teach young readers much about understanding, acceptance, and forgiveness.